Italy’s most recognizable purveyors of folk metal have returned with their eight full length album, The Pagan Manifesto, in spring of 2014. The band’s debut album, 2001′s Heathenreel, remains one of the benchmarks that folk metal albums are judged by and, despite a brief dip in quality during their middling years, Elvenking have forged their sound into a unique combination of folk melodies and melodic power metal. After two well received albums in 2010 (Red Silent Tides) and 2012 (Era), you could pretty much surmise that Elvenking has been on cruise control these past few years. The Pagan Manifesto is a solid continuation of Elvenking’s tried and true sound with , dare I say it, a more mature approach than previously presented. As silly as it sounds calling an album with track titles like “King of the Elves” and “Moonbeam Stone Circle” a band’s most mature, I have to firmly put my foot down; Elvenking has grown up, a bit. The band’s solid mix of heady power metal and tavern-styled folk music is still present. Hell this is a more folk-driven album than anything the band has put out in years, but the solid interplay between driving rhythms and classy melodies is more focused and dynamic than before. Perhaps the frequent segues into balladry, like the solid duet with Amanda Somerville during “King of the Elves”, replete with melodic clean guitar patterns and restrained instrumentation or the heavier riffing and more engaging guitar rhythms like on “Witches Gather”, help push Elvenking into the realms of a more mature sound. Like on Era the melodic, sing-along choruses are still Elvenking’s bread and butter. Nearly every track moves into some type of ultra-catchy, fist pumping vocal hooks. Damna’s voice has surely improved with age, as his vocals this time around range from poppy melodies to his higher register, power metal style that seems to exude confidence. The same could be said for the rest of the band, as the guitar riffs are chunkier and more driving than before, like on “Grandier’s Funeral Pyre”, but they still retain the solid interplay between the folk instrumentation. Tracks like “Moonbeam Stone Circle” and “Pagan Revelation” show that the band has not left their folk metal roots behind. There are plenty of upbeat folk rhythms and violin led melodies throughout the album, but it’s not exactly the main focus. Songs like “Black Roses for the Wicked One” show that Elvenking has learned how to utilize folk instrumentation in a way that doesn’t sound like a hokey tavern jaunt, as light keys and violin notes back a multi-tracked vocal approach with an extremely catchy chorus. Before you get all up in arms about this being a rightful, mature album, just remember that this is Elvenking. The vocals and choruses are still layered with all of the cheese and poppy Gammaweenery you can swing a sword at. I really don’t mind the cheese, as it makes for some extremely catchy moments. In fact, my only real complaint is that The Pagan Manifesto seems a tad too long for its own good. A little over sixty minutes of folky, melodic power metal is a somewhat overwhelming. I feel like if the band trimmed the edge a bit, it might make for more powerful release. 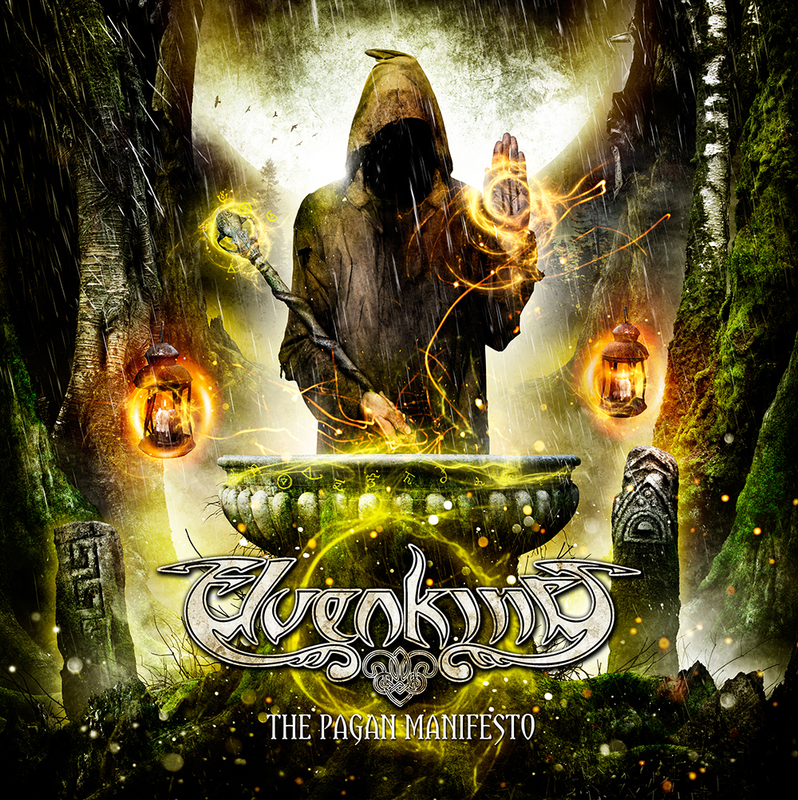 Regardless, Elvenking’s eighth opus, The Pagan Manifesto, serves as the band’s most mature release to date, encompassing all of the traits that made them so memorable in the past. Love them or hate them, Italy’s most popular folk metal merchants write catchy songs and The Pagan Manifesto is no different.